The ancient Greeks knew that armor could be made of linen, woven from fibers of the flax plant, (Linum usittatisimum L.). Anyone at recitation of Homer’s Iliad would have heard Ajax the Lesser described with the term “linothorex”, thus “linen cuirassed” (Il.2.529). 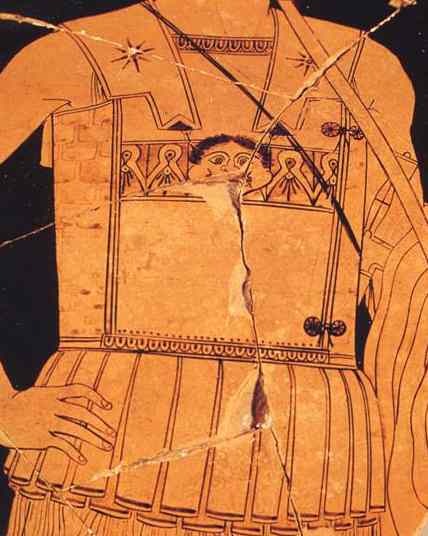 The current debate centers on whether or not we can apply the term “linothorax” to a specific type of armor that is widely seen depicted on vase imagery and in sculpture. The earliest depictions of hoplites show them to be armored in bronze plate, but 6th century BC saw the emergence of a new type of corselet that was probably constructed of organic materials given the lack of archaeological evidence. Woven linen and leather have been suggested for the base material, but there is no agreement as to which is more likely. I will present arguments for and against each, and hope to foster a consensus. This armor was used from Skythia to North Africa, and remained in use alongside the plate cuirass throughout the Classical and Hellenistic periods. Almost all of the details of its construction are garnered from vase images, many of which are quite detailed, with archaeological finds limited to metal fittings and a single rendering of the type done in iron from a late 4th century Macedonian royal tomb at Vergina. The armor consisted of two main portions. The torso was protected by a “tube” or “box” that wrapped around the body, was scalloped to fit under the arms, and had a raised panel to cover the upper chest. 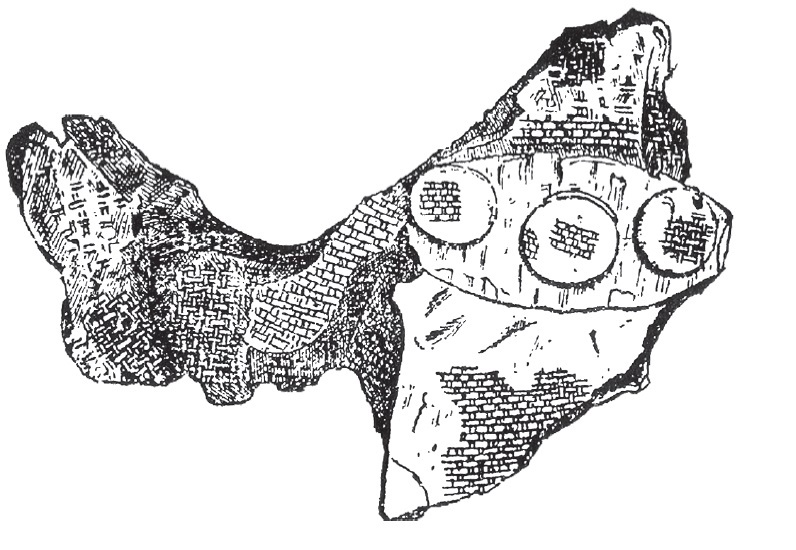 Many of these corslets show broad bands across the upper chest and midsection decorated with a key pattern or similar design. Just above the hips, the bottom of the tube was cut into strips, pteryges, which facilitated bending, while covering the lower abdomen. Usually there was a double layer of pteryges, which were staggered so that the inner layer filled gaps created in the outer layer as the hoplite moved. Most images show hoplites fastening the tube by means of thongs tied at the left, front to form a cylinder, perhaps because the left side of a hoplite was covered by his large shield. There seems to have been variation in exactly how the tube section was brought together. The side panel may have simply been butted to the front panel and secured, but the single extant copy of the armor from Vergina is double breasted, overlapping the chest region from both directions. 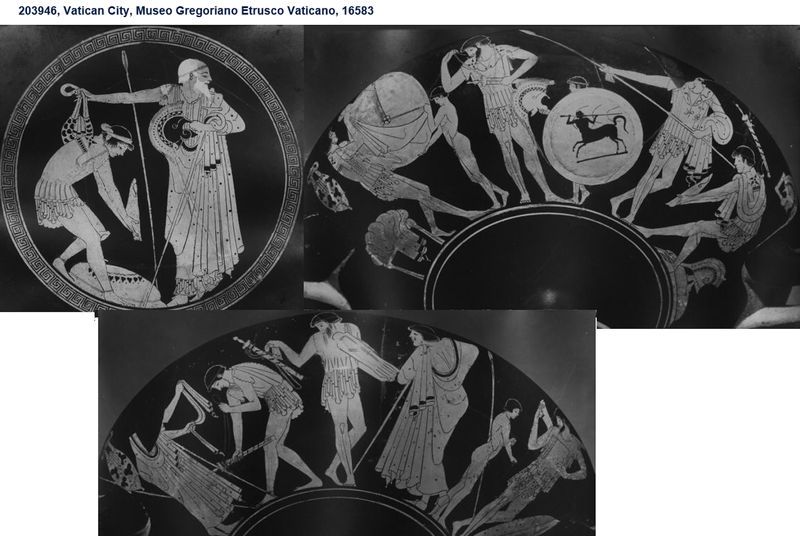 Other images, like that on a vase from the Museo Etrusco Gregoriano (inv. 16583), show a tab with no pteryges of about a quarter the width of the chest panel wrapping around in front. This would serve to cover the seam where the sections meet. Affixed to the upper back of the tube, or perhaps cut from the same piece of material, was a panel that protected the shoulders. Two flaps, epomides, arose from this and extended over the shoulders like a “yoke” to be tied down to the chest panel. The epomides were generally long and broad, especially in the early period, extending well down the chest and flaring out laterally from along side the neck to just before or beyond the shoulders. There manner in which the flaps were tied down could be complex, with thongs simply attaching to lateral rings, crossing the chest to secure on opposite sides, meeting in the center, or apparently passing through lateral and central attachment points. One advantage of this system was to allow the epomides to be secured and tensioned independently. For a hoplite this was important because he spent much of his time with his arm raised for overhand strikes with the spear. If weight were distributed evenly between the shoulder flaps when the arms are lowered, then it would have been disproportionally borne on the right shoulder as the arm was raised. Another aid in the overhand strike was that the thongs on the epomides emerge close to their inner edge. Thus, when the arm was lifted, the shoulder flaps naturally hinge up on their inner edge. Between the two shoulder flaps a square section arose to stand up behind the back of the neck. Because the term linothorax implies a mode of construction, I will use a term for the armor based on the morphology just described instead of material: the “Tube and Yoke” (T-Y) corslet. 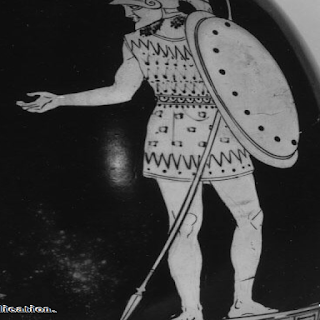 It is difficult to determine when this armor type first appeared in the Greek world. Hoplites wore only a simple tunic or chitoniskos beneath their cuirasses, so there was nothing like an arming doublet that could have developed into an organic armor. 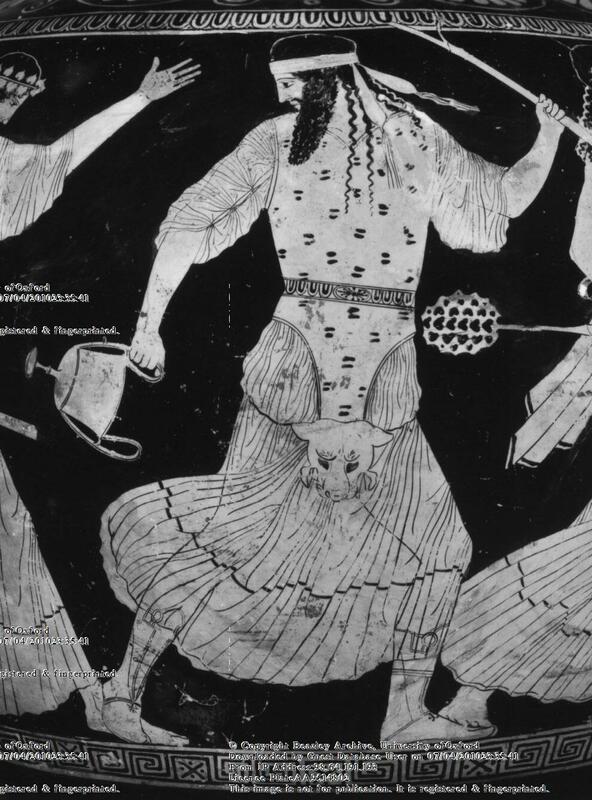 There also was no armor with these characteristic seen outside of Greece that could have been imported. In close combat a hoplite could shelter most of body behind his shield, but his head and often his shoulders would go uncovered as he fought. Attacks coming from above might glance off the helmet onto the shoulders or impact them directly. When battles came to pushing, othismos, the broad, flat surface of the flap as it lies over the left front chest provided a perfect surface to rest the bottom of the shield rim against. Interestingly, while the broad epomides seen on some vases overlapping the shoulder would have allowed the inner rim of the bowl-shaped shield to rest upon them when marching, pushing with the shoulder in this position would force the flap into the hoplite’s neck. Many cultures had armors made of textile or leather, and quilted armor existed in Greece during the Mycenaean period. These armors usually look like a vest or jacket. One reason for the T-Y’s shape would be that the material from which it was constructed was particularly stiff. Much has been made of images that show epomides springing back to stand straight up when unsecured, but the need to cut pteryges into the bottom of the tube to allow for freedom of movement when bending also indicates stiffness. These corslets are shown holding their form when not being worn, as on a vase at Zurich University (L5). The apparent stiffness of the corslet has meant that any material that cannot be rendered this stiff has been rejected as a base for the armor. The form of the T-Y corslet has a major advantage over vest-cut armor that pulls over the head. Hoplites could quickly undo the thongs tying the armor together to allow for air flow. Anyone who has worn body armor or sports pads, such as football shoulder pads, knows that simply unfastening them in this manner cools the body greatly. 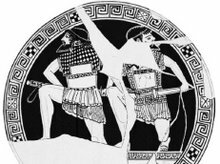 There are vase images that show hoplites in a characteristic state of undress, with the tube unfastened and hanging opened on the left side and the shoulder flap on the opposite side undone. Me in my spolas of leather in an at ease position with the weight suspended from only the left shoulder. They are usually portrayed as white on black-ware vases of the latter 6th c BC. Usually, white was reserved for organic components, such as the flesh tone of female figures, sword hilts, and chitons that were probably textile. Some of these chitons extended to mid-thigh and show a crosshatched pattern that might show quilting, perhaps indicating that these were a light armor in their own right. Early T-Ys show very broad epomides, often meeting in the middle of the chest. By the end of the 4th c BC, the epomides are move to the side of the chest and are generally reduced in length and width. Perhaps this reflects a move away from hoplite tactics. The corslet also becomes higher waisted and one or two additional tiers of pteryges are added extending down the thighs. Pteryges are sometimes seen at the shoulders as well, perhaps to make up for the epomides reduction in size. Adding metal scales, bronze, rawhide, or iron, was a common feature of these armors. The variation in shape, number and placement on the armor is staggering. So much so that I would caution trying to draw too many conclusions, such as how weapons were used, based on scale placement. But this article shall focus mainly on the base material. I will note that it is unclear that scales add protection rather than add flexibility for the same level of protection. The first reference to linen armor that is truly relevant to the T-Y corslet comes from the poet Alcaeus, born to an aristocratic family from Mytilene on Lesbos around 620 BC. In a poem of the early 6th c, he describes arms and armor, probably hanging in a temple. There are obvious hoplite accoutrements, such as bronze greaves and hollow shields, but among these he writes of “White corslets of new linen” (fr. V 140). This puts a description of an organic armor in the characteristic white color within a few decades of the depiction on the Francois vase, and must be considered a T-Y corselet unless another candidate armor emerges. He and his older brother Antimenidas served as mercenaries for the Egyptians and Babylonians respectively. Hoplite mercenaries serving abroad may have brought home new types of armor, or ideas for making armor from new materials. Herodotus describes a number of linen corselets in foreign use. He tells us that Amasis, King of Egypt, sent “Thorakes lineoi” to the temple of Athena at Lindos (Hdt. 2.182) and Sparta (Hdt. 3.47). Thorakes can mean anything covering the chest, so we cannot be certain that these armor at all, and not simply a fine garment, but Herodotus describes the Assyrians as wearing linen “thorakes” (Hdt. 7.63) and here it is surely armor. Interestingly he describes the Persians as making use of “Egyptian thorakes” (Hdt. 1.135). A century later Xenophon, describing the armor of a 6th century Persian, Abradatas, tells us that he wore a “linen corslet as was the custom of his country” (Xen Cyrop. 6.4.3), so linen corslets may have been common throughout Egypt and the Near East. Xenophon also describes another Anatolian people of his own day, the Chalybians, as wearing line “thorakes” with “a thick fringe of plaited cords instead of pteryges” (Xen. Anab. 4.7.15). This is a reference to the T-Y corselet based on the pteryges, but we must be cautious in reading too much into the reference. He does not clearly state that the Greek corslets are linen as well, only of similar form. There is a somewhat muddled reference to linen armor in Xenophon’s day that is often cited in support of the T-Y being a textile armor. Cornelius Nepos, in his life of Iphicrates, mentions that among the other military reform the general enacted was switch from “linked or brazen” to linen armor (Nep. Iph. 1.4). Not only is his mention of mail armor anachronistic, but this change in armor is missing from our other main source for his reforms (Dio. Sic. 15.44). More troubling, and seemingly overlooked by proponents of linen being commonly used during the Classical period, this shift was described as a reform, a new addition to the panoply, and so not a common item. Probably the most reliable evidence for the use of linen armor in the 4th century comes from Aeneas Tacticus written about 350 BC. In describing how weapons in one instance were smuggled into a city, he lists among the armor brought in “Thorakes lineoi” (Aen. Tactic. 29.1-4). We shall return to this reference later. When Alexander the Great was reinforced in Asia by allied and mercenary troops, they also brought along new suits of armor for his men, so he burnt his men’s old armor, which must have been organic (Curtius 9.3.21). He himself wore a linen armor we are told at the battle of Guagamela: “a breastplate of two-ply linen from the spoils taken at Issus” (Plut Alex. 32.5). This of course is very likely of Persian make and so may not inform us on the other organic armors worn by Macedonians. Pausanias relates a note of caution on the use of linen armor. He tells us that “Linen breastplates are not so useful to fighters, for they let the iron pass through, if the blow be a violent one. They aid hunters, however, for the teeth of lions or leopards break off in them.” (Paus. 1.21.7). One problem with linen as a base for armor is that it is notoriously expensive to grow. Both Virgil (Georgics1.91) and Pliny (HN 19.2.7) remarked on the fact that flax seriously depletes the soil, so Greeks with limited tillable land probably imported most of their high quality linen. Egypt, Syria, and Colchis were famed for their linen. Strabo (11.2.17) tells us that linen export was used as a basis by some in the assumption of kinship between Colchis and Egypt. For such an idea to flourish, high quality and/or high volume production must have been a rarity. Linen fiber quality is tied to length, with short fibers known as tow and limited in their uses. Linen is inelastic and presents a challenge to the weaver in forcing one thread over another if they are thick and a dense weave is desired. The solution to this problem can be seen in a pseudomorph, a mold formed during decay, of an Etruscan textile at Newark Museum, NJ, USA. By simply doubling the warp threads that the weaver forces the weft line around, you get a denser weave without having to force the linen to bend around each individual warp thread. This cloth could be made very heavy. We have seen that a candidate material needs to be stiff, light in color, and show broad flat panels or rounded surfaces. Many cultures made textile armor by stitching many layers of fabric together or stuffing padding between two shells to form a thick quilted structure. Objections to this type of construction include the fact that we generally do not see stitching patterns on vase portrayals of the armor and some have doubted the stiffness of stitched or quilted fabric. To the first objection, it must be noted that some vase images do show cross-hatched patterns or vertical lines that may best be explained as quilting. The Pompeian “Alexander Mosaic” of the battle of Issos shows many of the retreating Persians in what looks very much like quilted armor. Recall that Alexander was said to have taken a 2 ply linen armor in this battle, and two layers, filled with batting could be effective protection. The stiffness of stitched linen is governed by how close the rows of stitched can be made and the number of layers of fabric used. Dan Howard, has championed a style of close stitching that renders stiff panels as seen today on the flaring shoulder protection used in the Japanese sport of Kendo. Such close stitching might not be prominent enough to have been rendered by artists. An ingenious solution to the problem of making stiff, flat linen panels was suggested by Peter Connolly. Instead of stitching layers of linen together, he glued them together in 0.5 cm thick panels. The resultant armor weighed 3.6 kg, which is less than a bronze cuirass of similar size. Following his suggestion, many have constructed T-Y corselets of linen and glue. The product is stiff and hard, but vulnerable to moisture, sweat being the biggest threat. Once soggy it becomes gummy and gains weight as it absorbs water, so a waterproof layer of resin, lanolin, olive or linseed oil, or beeswax is needed. Glued linen construction seems to have become the default for the T-Y. This is troubling, because there is no archeological data or pre-existing industry on which to base glued construction. Analogies must be drawn from far different applications, such as the lamination of wood or exotic procedures like the wrapping of Egyptian mummies in gummed linen bands. In the end the argument boils down to that fact they could have made glued linen given the technology of the day and it seems to provide adequate protection. Recently, a group at the University of Wisconsin, Green Bay, headed by Greg Aldrete and Scott Bartell have tested a variety of linen armors, both quilted and glued of between 11 and 20 layers. Using authentic hand woven linen and either rabbit or flaxseed glue, they found glued linen to be superior in protectiveness to quilted or stitched linen against period appropriate weaponry. These findings are counter to what others have found in the past, and problems with reproducibility in tests such as this will ensure debate. As a scientist, my advice to those attempting such tests is that it is far more important to work off of a standard protocol than it is to use authentic weaponry. Luckily textile body armor is back in vogue, so we can tailor future tests to protocols such as that of the National Institute of Justice (NIJ). We have previously seen that Xenophon was familiar with a thorax made of linen, but he never describes his fellow Greeks as wearing them. Instead he uses a specific term when describing items which appear to be armor, but are not bronze cuirasses. On the long retreat back to Greece after finding themselves on the wrong side of a civil war in Persia, Xenophon and the other Greek mercenaries needed of a force of cavalry (Xen.Anab.3.3.20). They cobbled together a troop of 50 horsemen from the few horses they had along with them. They needed body armor because Greek horsemen did not bear shields at this date, and the armor types donated to these men were described as “spolades and thorakes”. 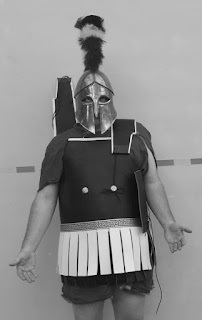 Paul McDonnell-Staff, to whom I am indebted for much of the discussion of leather armor, in studying Xenophon’s use of the term thorakes suggests that, when the term is unqualified by another term like lineon, is equated with the bronze cuirass. For example, a little later Xenophon finds himself afoot and heavily encumbered by his cavalry thorax (Xen.Anab.3.4.48), probably metal plate. Note that Xenophon is not encumbered by a spolados and thorax, suggesting that the spolados is not simply a type of undergarment. Although there are exceptions, generally when a wound is described as occurring through a piece of equipment it is because it was expected to protect from such attack. Xenophon described the death of the Laconian Leonymus when an arrow pierced both his shield and his spolados (Xen.Anab.4.1.18). Julius Pollux, a late 2nd century AD professor of rhetoric at Athens tells us that the “spolas is a thorax of leather, hanging from the shoulders, so that Xenophon says ‘and the spolas instead of thorax’” (Onomast. 7.70). This definition is corroborated by Hesychius of Alexandria, 5th century AD, who apparently drew from an independent source. He wrote of the spolas that is was a “short leather chiton, the leather thorax.” The words used for the leather associated with the thorax are different, but in both instances are associated with animal hide. Pollux uses a term that could also be used to describe a lion skin wrapped around a hero or the facing of a shield (Hom. Il. 10.23, 6.117), while the word Hesychius uses implies rawhide such as that of the drumhead described by Euripides (E.Ba.513). Perhaps the yoke section of the T-Y originated as a separate piece like a hide hung from the shoulders. Pollux goes on to say that “Sophocles called it a Libyan: a Libyan spolas, a leopard skin.” Leopard skins can be seen on vase depictions worn like an exomis, or short cloak, hanging from the left shoulder. Short length, hide or leather construction, and suspension from the shoulders may be the defining characteristics of the spolas. These are also clearly characters of the T-Y corselet. There is another mention of the word spolas in the latter 5th century. This occurs in a comedy by Aristophanes (Aristoph. Birds. 933), where a priest’s acolyte is asked to remove his spolada and give it another. Here it is unclear what the garment is, but it is something worn over his tunic, and a leather apron, such as workmen wear or a frontlet to protect from the blood of sacrificed animals is a possibility that fits with the other definitions. As well as mentioning leather armor, what Xenophon doesn’t mention may be just as important. In two separate works he describes Ephesus preparing for war (Xen.Hell. 3.4.17, Xen Ages. 1.26). He lists all the craftsmen required to equip an army, including leather workers, but there is no weaver or linen processor. The ancient Greeks imported much of their leather from The Cyrenaic and Pontic regions, but cities like Athens had thriving tanning industries. The general and demagogue Cleon was lampooned by Aristophanes based on the smells associated with the tanneries that Made Cleon’s father rich. Cleon was a notorious warmonger, and profiteering, perhaps in armor, may have influenced his politics. Leather can easily form broad flat surfaces, but as to stiffness, we must consider what type of leather is to be used. Vegetable tanned leather, which relies on the use of tannins from bark, nut hulls, or other vegetable matter, produces fine leather than will not putrefy in water. 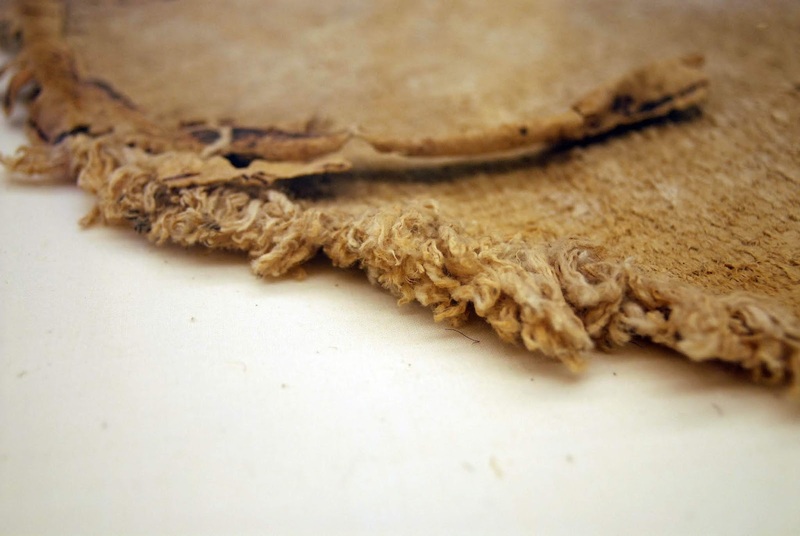 Its resilience recommends it for a wide variety of clothing applications, but a single layer of tanned ox hide will not produce the stiffness seen in the T-Y without further processing. It can be rendered hard enough to hold a molded form by boiling it in water, oil or wax. The result is stiff, but brittle. A second method would be to simply laminate multiple layers of leather together. Unlike linen, leather will stick to itself via its own collagen, but casein, from milk, in an alkaline solvent is commonly used as well. A tanned hide might not be pale enough to warrant it being illustrated in white. Buff leather, tanned in oil, alum tawed leather, and rawhide might be pale enough for this. Alum tawed leather in particular is vivid white and can be either very stiff like rawhide or creamy soft depending on the processing, but like rawhide it is unstable and vulnerable to moisture. Perhaps the most likely candidate is a combination of processes. Buff or vegetable tanned leather could be treated with alum in order to produce a stiff, white product. I previously presented only part of a passage by Aeneas Tacticus on smuggling weapons into a city, the expanded list of items reads: “Thorakes lineoi, Stolidia, perikephalaia, hopla, knemides….” (Aen. Tactic. 29.1-4). The first item is of course linen corslets, but the second is leather corslets! Aeneas is describing both types of T-Y in use concurrently. This is not the only instance of their joint appearance. Both leather and linen armors can be found side by side in the records of a temple treasury on Delos. Ruben Post pointed me to a series of redundant fragments of inventory lists from 342-340 BC (ID 104(26, 28, 29) include version of the line “Thorakia skutinous...Linou...spoladion.” The first item is leather thorakes and the second is fragmented but lists something that is linen and may well describe a stoladion, confounding all of our terminology. If leather construction does not define the spolas, then it may have been used interchangeably with thorax. Alternately, these two words may refer, not to different material, but to a different construction. Clearly the term “linothorax” is inappropriate for the T-Y corslet, or at least incomplete. There is every possibility that a single corslet could be of composite linen and leather construction, perhaps linen tube and leather yoke. Either we must agree on a term that is purely based on morphology, not material, like “tube and yoke corslet,” or we must add some variant of spolas/stolidion or “skutinothorax” to indicate those armors that are made of leather. Gleba has proposed that warp-twined linen greave found at Dura Europos may be a model for the tube and yoke as well. She notes that twining of many yarns would explain Pliny the Elder’s comment that a thorax dedicated by Amasis had an exceptional thread-count of 360. Certainly, a breastplate that Alexander acquired from the spoils taken at Issus and composed of “two-ply linens” could only have been made of so few layers if they were exceptionally robust. These thick layers need not have been glued or stitched together. They may in fact have been woven in multiple layers in a process known as 3-D weaving. Nymphopdorous says that the armor is called aegis by the Spartans Hesychius Lexicogr., Lexicon (Α—Ο). Aegis is a term which refers to a leather hide of a goat. This looks very much like a "Tube" without epomides and with tassles in place of ptyruges. A heavy garment, probably linen. similar in thickness to the perizoma sometimes worn as a skirt under bronze cuirasses. This is clearly a leopard skin in a vest-cut garment. Aelian uses an enigmatic term argilos, meaning ‘white clay’, to describe an armor appropriate for light troops. Some have translated this as a bright white tunic, while others have taken him to have meant ‘flashy’; however, it could well be that he literally white-colored clay. A type of fine white clay, known to as kaolin, was widely used by the ancient Greeks. It was a white pottery glaze, and a slip of kaolin formed the drawing surface on white oil jars (lekythoi), which became popular in early the 5th century. Theophrastus of Eresos, on Lesbos, in his late 4th century treatise On Stones described possible kaolins as Melian and Samian earths. They were commonly used in fulling and bleaching textiles. We are benefited in our study of ancient armor that textile body armor has come back into fashion. A recent study showed that the ability of Kevlar armor to defeat spike and knife threats can be significantly increased if kaolin is intercalated into the weave. The clay stiffens through a process called “shear-thickening”, wherein the clay-coated fibers are pliable if slowly pushed against, but resist sliding past each other at speed and when impacted at high velocity. This sees the clay particles form an atomic lattice that for the briefest moment is hard as ceramic. Reinforcement with kaolin has an advantage over other techniques proposed to make textile tube and yoke corselets in that such clay was often a component of the bleaching process of linen garments. A clear evolution of the armor from incompletely rinsed white linen is thus easy to envision. 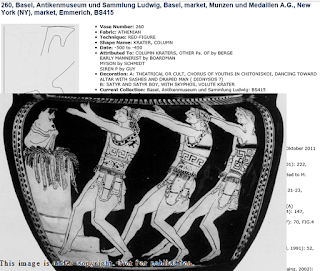 The tube and yoke became popular at Athens not long before the appearance of white-ground pottery, perhaps reflecting an increase in imports of fine kaolin for a variety of tasks. The intercalation of kaolin clay unambiguously improved the ability of linen to resist the razor-tipped arrows. 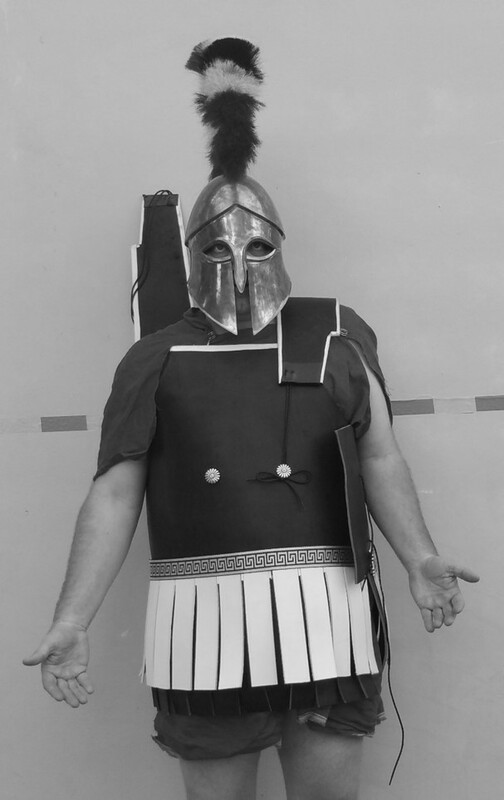 These results in no way prove that hoplites made use of the properties of non-Newtonian fluid physics to make their armor more resistant; all the same, they do suggest a provocative new course for our study. Our only source for the exact appearance of the tube and yoke comes from images on vases, so perhaps it is fitting that the culture that made this pottery famous spread its influence not by ranks of bronze, but rather by rows of clay. Rosen et al. 2007. Shear-thickening can be seen by stabbing forcefully into a dilatant like oobleck, which is a thick slurry of corn starch. No better discussion on the topic can be found than that on http://www.romanarmytalk.com I wish to thank all of the contributors to the discussions there whose opinions are to be found in this article. Bardunias, P. and Rey, F. (2016) Hoplites at War. Anderson, J.K. (1970), Military theory and practice in the age of Xenophon, University of California Press. Williams, A. (2003), The knight and the blast furnace: a history of the metallurgy of armour in the Middle Ages & the early modern period. Volume 12 of History of warfare. Brill.